Sometimes you just want to put on a comfortable, simple pair of jeans. 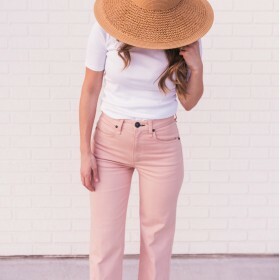 In times like those look to your new trusty pair of women’s straight leg jeans – and let us help you find them on Fashiola! Simply choose your size, color and even brand or shop and then you compare a wide range of women’s straight leg jeans available online! Not sure how to style straight leg jeans? Why not roll up the hems on a casual blue pair and put on some slip-on Vans sneakers. Looking for something a little more dressed up: a pair of slide-on heels with a chunky block-heel (in a bright red, dreamy) is another perfect choice for women’s straight leg jeans.